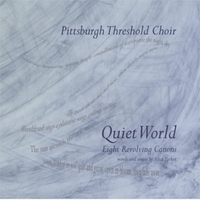 "Quiet World" is a set of eight songs for singing at bedside commissioned by the Pittsburgh Threshold Choir in 2014. Each song is a canon with lyrics that describe the full life cycle of a single natural phenomenon: Sun, Moon, Stars, Springs, Seeds, Winds, Waters and Woodthrush. Each song is also a harmony line for all of the others, so they can be sung in thousands of combinations. This recording is a sampling of some combinations that we found interesting and that we think will be calming for anyone in need of a peaceful listening experience. Alice Parker has also released the score on the Melodious Accord website for anyone who is interested in experimenting with these songs. We hope you enjoy our recording, and we can't wait to hear what others hear in these songs.